This was published several months ago but disappeared into cyberspace. Apparently Parkie hit a wrong key and it went somewhere else. If you are the average person with Parkinson’s, it probably took you anywhere from 1-3 years to get the right diagnosis. And once you got the diagnosis, your doctor gave you a prescription to fill and a return appointment 3 months later. While you were in a state of shock from receiving the diagnosis, you were in no condition to question this. You went home and crawled into bed, trying to figure out what lies ahead for you. 1: Refer patients to a Movement Disorders Specialist (MDS) if there is one nearby. A movement disorder specialist is a neurologist who has received additional training in Parkinson’s disease (PD) and other movement disorders including dystonia, chorea, tics and tremors. They are more knowledgeable about the latest treatment options, the need for exercise and all things Parkinson’s. 2. If they cannot refer the patients to a MDS, have materials from the Parkinson’s Foundation, Michael J Fox Foundation, Davis Phinney Foundation, local support groups or organizations, and other resources available for the patients. PwP’s need to learn what they can do to help improve their quality of life early in order to cope with their diagnosis. This new, unwanted friend will be with them for the rest of their lives, so the sooner a person can take action, the better off they will be. 3. Schedule a follow-up appointment within a month and encourage the patient to bring someone with them to listen and to ask questions. 4. 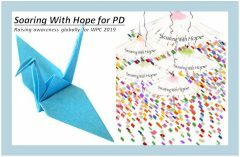 Connect the newly diagnosed person with Patient Mentor who can talk to him/her on a personal level about living with PD. Several organizations have Patient Ambassadors or Mentors who are comfortable in this role and are happy to help. I have met a number of newly diagnosed Parkies for coffee, and they are always surprised when they see me since I don’t fit the image that they had of someone with PD. 5. Most importantly, the doctor should tell them to start moving. Exercise has been shown to be the best medicine for PD. They should advise the PwP to start slowly if he/she has not been exercising, and increase the duration and intensity over time. A referral to a physical therapist trained to work with PwP’s is always a good first step to living well with PD. NO ONE should be sent home with only a prescription and a return appointment 3 months later. Given the right information and instructions, the newly diagnosed Parkie will be much more prepared for a future with Parkinson’s. I was diagnosed with Parkinson’s exactly how it is described in your blog. It took two years to educate myself- put together a plan and to “ get a grip”. I recently returned to the original movement disorder specialist and addressed the issue of my initial diagnosis. She said it is difficult to give this news. I think the steps here are a great way to start. Thank you. The first doctor I went to did the same to me. After 6 months I refused to go back to him and my primary care doctor sent me to an MDS who was wonderful. I recently asked my doctor why he sent me to a neurologist the first time. He said that the neurologist was a good doctor and thought he would be fine for me I don’t think at the time that my doc knew there was a difference between a neurologist and MDS. He now jokes that I know more about PD than he does. Well said. This is so important. I almost feel like those of us who are advocates/ambassadors need to start speaking at the medical schools. We need to get to the students before they are ingrained with the faulty thinking that there is nothing to be done about PD.